Recently we had the opportunity to review a beautifully hand embroidered Baba Sling . When we received our sling, we knew right away, we'd love it with all those beautiful stitches. It was a gorgeous day out so we decided to give the hammock-like baby sling a test run. I really liked the durability, and that it was clipped over my shoulder. My sister and I had a very nice walk to the park. Both her and I tried it out with my niece whom fit comfortably and safely inside. Baba Slings is friend/family operated company. They like keeping things family oriented, all the photos from their web site and promotional material are done by a friend of the family. 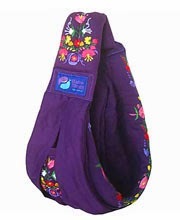 Baba Slings were designed by a mother of five children, Shanti McIvor. While Shanti was pregnant with her second child she did a lot of research concerning "attachment parenting" and "baby wearing". She designed and carried her own baby in the very first Baba Sling. She received a lot of public interest and decided to sell them at a local market. Thirteen years later and Baba Slings are the top selling baby slings in Japan and are sought after all over the world. The mission of Baba Slings is to provide families with comfortable, high quality and beautiful baby slings that aid in the transition from birth through toddlerhood. All products stocked at Baba Slings are made in no sweat/fair trade operation. Organic materials are used wherever possible, they aim to go completely organic in the near future. The Baba Slings are easily adjustable making it easy for both moms and dads to wear them. A specialty imported high quality side release ski buckle with dividers for straps and built in safety strap and buckle. The slings are 100% cotton and machine washable. They come in all kinds of fashionable colors, patterns, and plain colors. They meet the highest in quality control. As my sister used the Baba Sling she really liked that it was easy and comfortable to breastfeed. Her baby is a preemie and she fits in nice and snug. I think if your a parent or expecting you should check out Baba Slings as they are a really great find. I love the design and fabric! This looks very comfortable for mom and baby! this is really pretty! and i love the padding around the shoulder! this would be for me! we have another little one due this winter! I would use the sling. Baby boy due in February! i love that they use fair trade practices and try to use organic materials when possible! that sling is beautiful. I'd love to use this for my first little one due soon! This is really pretty, and I love that it's from a small company that has good values, is concerned about the welfare of the workers and the quality of the materials. My husband and I will be using the sling. Love it! I'm leery of most of these, but I really like this design! Especially appreciate that it isn't difficult to put on and be ready! I'm not a fan of things that are difficult when it comes to getting going! The sling would be for me since I just had a baby. This is definitely an awesome sling, I love the details and color. I'd be using this myself- if my little one doesn't like it, I have a good friend I'd give it to. I like that it looks like a good carrier for breastfeeding. Slings are really useful. My daughter-in-law loved hers. These are stylish, too. I like that it hide the baby so that way you don't have people alawys looking at you or your baby. Trying to touch or hold your baby. These are so cute! I've never seen anyone using one of these slings. Would love to try it. This looks like a great product, it's cute and simple to use, would love to try one. I love babywearing, and when it's done with such a beautiful product, it makes it that much more enjoyable! I would LOVE to try a Boba with our newest addition coming soon! I would love to use this. I am expecting baby #5 in 49 days. I really like this sling. I am looking for something like this for baby #3 who will be joining our family in April! I am glad that I can use a Baba Sling with a newborn as well as a toddler. I love baby wearing and this sling style is the best for a tiny new baby. The pretty embroidery and extra padding makes this version very nice! I love that this sling transitions through toddlerhood - we would get plenty of use out of this gorgeous sling! I like that you can breastfeed in it! I'm loving the fact these slings are fair trade and organic! Thanks! This sling looks great! And I love the thought of any type of baby wearing that makes breastfeeding easy. I've never seen a sling built quite like this - I'd be interested to see what it's like.